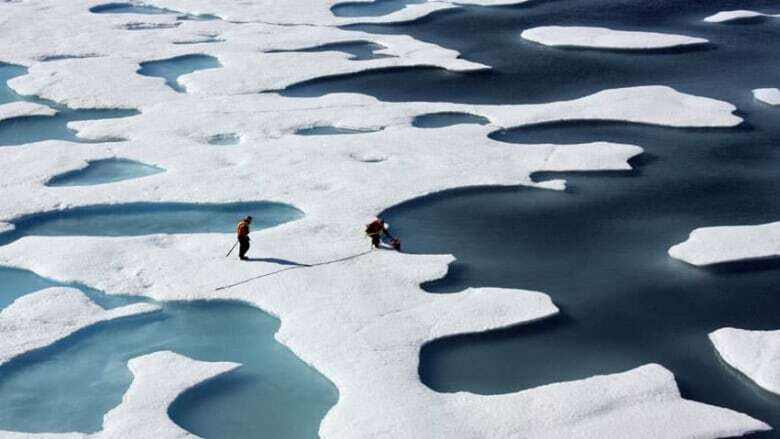 Arctic sea ice is melting at a pace so much faster than once thought that the latest projections say it might disappear by as soon as 2022, according to measurements from the European Space Agency. An analysis from the CryoSat-2 satellite indicates that 900 cubic kilometres of Arctic ice has disappeared each year since 2004. At such a rate, scientists warn the Arctic could be ice-free in 10 years. An analysis from the CryoSat-2 probe, launched two years ago as a purpose-built satellite for studying the thickness of Arctic ice, suggests that 900 cubic kilometres of ice have disappeared every year since 2004. At such a dramatic rate, scientists say it's possible in 10 years that the Arctic could be ice-free for at least a day. "Very soon we may experience the iconic moment when, one day in the summer, we look at satellite images and see no sea ice coverage in the Arctic, just open water," Dr. Seymour Laxon, with London's Centre for Polar Observation and Modelling, told The Guardian newspaper. The data would mean that the thinning of Arctic ice is progressing 50 per cent faster than many polar scientists had previously predicted, suggesting that global warming and rising greenhouse gases could be contributing factors. The satellite estimates were cross-referenced with data obtained from NASA planes flying over the Arctic and submarines making measurements via sonar from beneath the ice. Laxon told BBC News the results should be accurate to within 10 centimetres. About 7,000 cubic kilometres of ice remained at the end of last summer. By contrast, there was 13,000 cubic km of sea ice in the Arctic in 2004. The loss of the Arctic's white ice caps even for a short period could have a profound rippling effect on ocean temperatures. The polar ice caps themselves have a surface that is so bright that 80 per cent of the sunlight it receives is reflected back into space, instead of being absorbed by the Earth. The absence of the ice caps would likely lead to rising ocean temperatures and release more of the greenhouse gas methane into the atmosphere, further accelerating global warming and rising sea levels. Laxon said that although the figures are dramatic, they are still based on preliminary studies and that the current rate of ice decline might slow down. Scientists also noted that the melting of sea ice cannot always be attributed to man-made climate change. For example, NASA last month pointed out a "freak event" in which nearly all of Greenland's massive ice sheet suddenly began melting. NASA stressed that the massive melt occurs roughly once every 150 years, and that records showed the last time it happened was in 1889.